Аркуда (Arkuda) is a Russian folk pagan metal band from Irkutsk, formed back in 2007. Their name comes from the Greek word for bear (αρκούδα). The band started its live performances in the end of 2008, when also its first demo was recorded. They signed a deal with the Russian label More Hate Productions and in 2013 they recorded their debut full-length album “Под Покровом Веков“, which was finally released in January of 2014. Since their beginning, Аркуда have experimented with various extreme metal genres, including black, thrash and death metal, coupled with folk melodies. This album contains both early songs of the band, along with newer compositions. Аркуда is actually trying to introduce itself with this work, giving us a general idea of its complete music anthology so far. “Под Покровом Веков“, which translates into “Under the Pall of the Centuries“, is almost 48 minutes long, including 9 songs totally. The band has a very good and technical sound, where rhythmic guitars, powerful bass, melodic synths, fast drums and acoustic instruments are all heard in the right level. After the short instrumental intro, the album starts with 3 of its most aggressive songs, especially the third track “Вера Tвоя Πод Πокровом Βеков”, where the death metal elements are most dominant than ever. After the fourth track, the album gets a more folk pagan metal orientation, that I clearly prefer. “Под Покровом Веков” has some issues in the overall “balance”, something expected since its songs are from various periods of the band. Despite the differences though, the pagan folk black metal nature of the band is quite dominant, giving a “common” solid atmosphere throughout the whole album. Either-way, the good thing is that the music is great and there are some excellent compositions, like the incredible 9-minute masterpiece “Баллада о Руси“. Аркуда’s vocals are also variable, as this genres demands, combining different types of screams and growls with epic clean male vocals in the characteristic Russian style. Of course all lyrics are in their native language, dealing with pagan themes, Russian mythology and history. 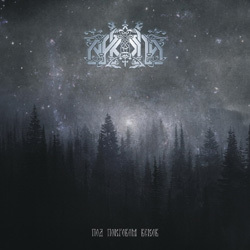 Аркуда is a great addition in the wonderful Russian pagan folk metal scene and their debut album is a nice recommendation for the fans of the genre. I hope the band composes new songs soon and offer us something more representative of its current sound. “Под Покровом Веков” is released by More Hate Productions in a standard jewel-case edition CD with 16-page booklet, including all lyrics. You can contact the band in their official profile on VK, or visit their label’s page for more info about the CD.